2S4000DX8PCM : 7.4volt 4000mAh rechargeable Li-PO battery pack for SPEkTRUM RC transmitters such as DX7s, DX8, DX9, and new DX6 & DX7 transmitters that can accomodate the SPMB4000LPTX square LiPO battery. Includes built-in PCM, for smart balance re-charging while installed in the transmitter. Also has built-in safety current circuitry, to prevent overcharging. Replaces original SPEkTRUM battery SPMB4000LPTX. Dimensions: Length:2.7 in (68mm), Width:2.0 in (52mm), Height:0.75 in (19mm). Important note: SPEkTRUM has enhanced their transmitter product line, and has several new & improved radios with pre-existing model numbers. 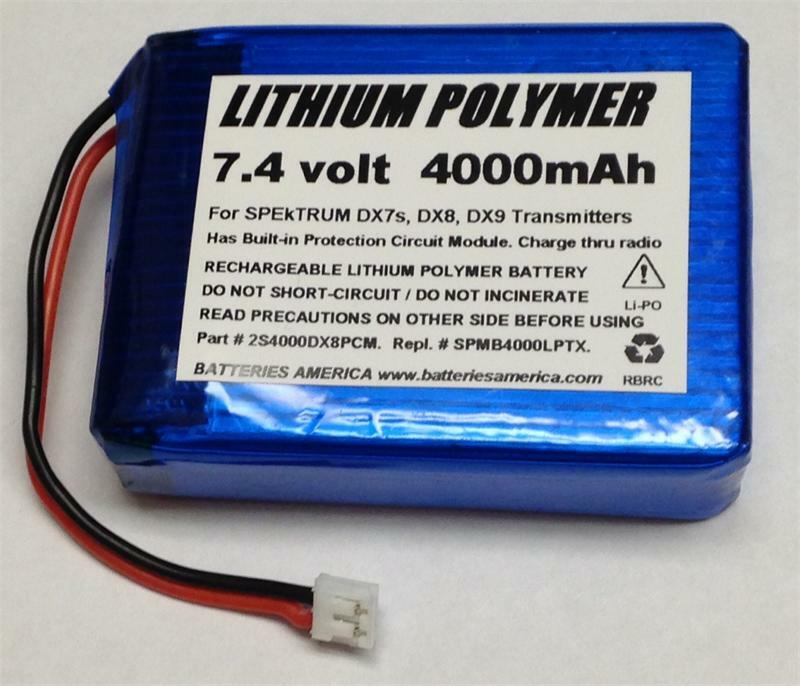 Certain new issue DX6 and DX7 radios now accept this 7.4v 4000mAh LiPO battery. To verify if your radio is compatible with out 2S4000DX8, open the battery compartment on the back of the transmitter, and see if the cavity will accept the battery per the dimensions listed above. 2-Pin Flat White Connector with wire leads - goes on JR & Spektrum transmitter battery packs (9.6v and 4.8v). Use this to replace an old connector, or for making a new battery pack. 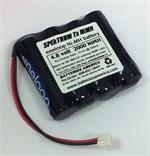 DX4.8Eneloop : 4.8volt rechargeable NiMH battery packs for Spektrum DX7s, DX8, & DX9 transmitters. PRE-CHARGED & READY TO USE. Choose eneloop 2000mAh or eneloop pro 2550mAh capacity. 2000mAh is $25.00, 2550mAh is $32.00. DX4.8-HR-3U : 4.8volt LONG LIFE NiMH Battery for Spektrum DX9, DX8, DX7s Tx. Choose 2500mAh or 2700mAh. DX4.8-HR-3U : 4.8 volt 2500mAh / 2700mAh NiMH (Sanyo HR-3U cells) rechargeable Tx battery for Spektrum DX8, DX7. SALE - 2500mAh are $25.95 each. 2700mAh are $32.95 each. 2S4000DX8 : 7.4 volt 4000mAh Li-PO battery for SPEkTRUM DX7s, DX8, DX9. Re-charges in SPEkTRUM Tx, OR with external smart balance chargers as well. WEB SPECIAL SALE eff. 10-29-15. 2S4000LPJR: 7.4v 4000mAh rechargeable Li-PO receiver battery for RC models. Replaces SPMB4000LP etc. Includes Balance connector, EC3 connector, and JR male connector. Use with SPEkTRUM, JR,HiTEC, Futaba, Airtronics Z systems. OUT OF STOCK until Sept 24. HiTEC X4AC PRO: NEW 4-channel 200 Watt AC / 300 Watt DC programmable professional charger. For Li-ION, Li-PO, Li-FE, Ni-Cd, Ni-MH, PB. Charge up to 4 battery packs at the same time! Loaded with accessories.